I just love this little boy to pieces! His personality shines through more every single day and he has such an endearing sweetness about him. He lights up our world! He’s so busy wriggling, rolling, knocking down blocks, and exploring the world around him that I’m so grateful for the tender moments. Those sweet snuggles are more precious than ever these days. I’m astonished at how quickly babies change. People told me this would happen, but there’s absolutely nothing like witnessing it for myself. I feel like Miles is a different baby every week. I think that the biggest change over this past month is how he communicates with us. He makes eye contact, mirrors our facial expressions (omg the smiles—I melt! ), reaches for objects (toys, Robert’s glasses, our faces, Remy’s tail, our fingers, and our food*), follows us around with his gaze, puts everything in his mouth, grunts when he wants something, and has a big vocabulary of coos. To think that all of this will continue to take off in the next few months makes me so very excited for what’s to come. I feel like I’m just getting to know him and he’s the absolute best. Truth be told, I was really worried about month four. I’d heard about the four month sleep regression and had visions of being up all night long. 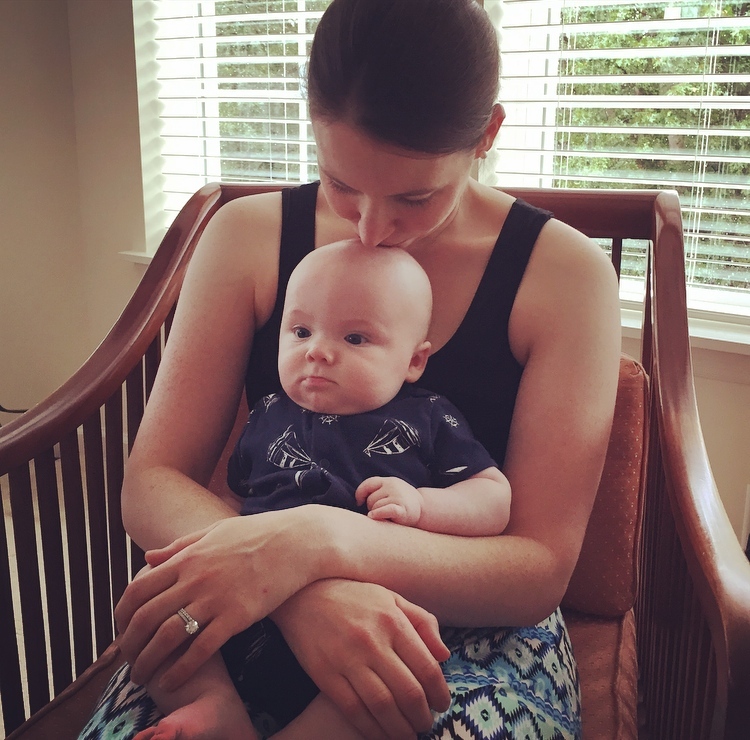 Without being able to nurse him to sleep (I guess I’m still not over it…) I was worried there’d be nothing I could do to help him during those long nights. Thankfully it wasn’t as hard as I feared, but sleep has been quite a roller coaster over the past month. 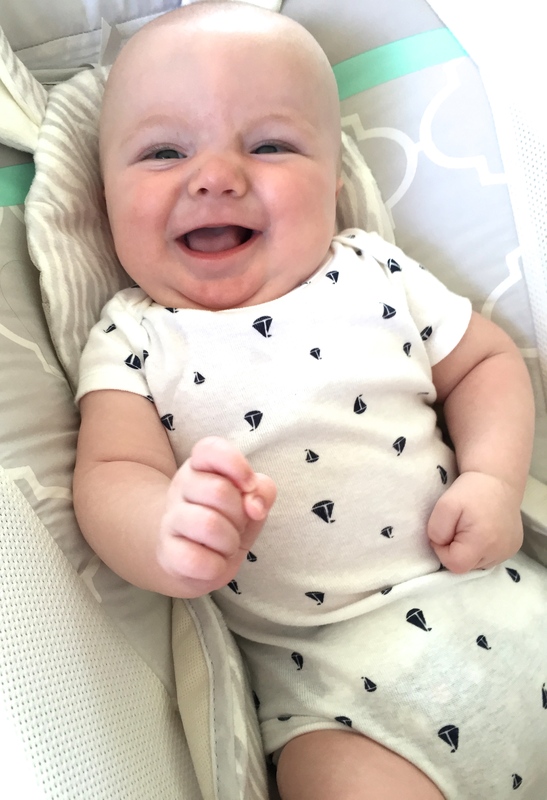 At the beginning of July I was pretty sure we’d won the baby sleep lottery because Miles went from waking up once or twice per night to sleeping through the night several nights in a row. 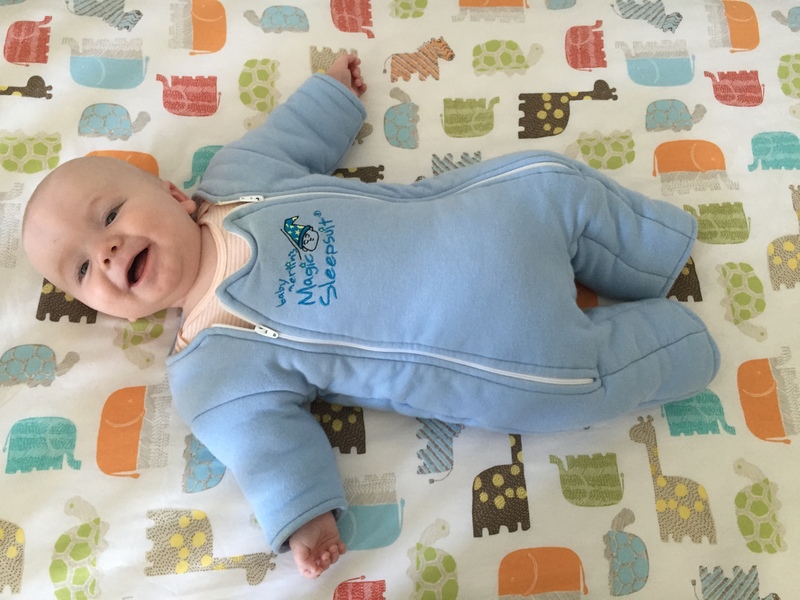 I was ecstatic…until he started waking up twice at night again (there’s that regression!) We’d feed him and, thankfully, he’d go back to sleep pretty easily each time. At the end of month four he dropped back down to one nightly wakeup. Now, the first week of month five, he’s been sleeping 12-hour stretches at night again and it’s spectacular. Let’s hope the streak continues! Falling asleep at night is another story. For naps, we can put him in his crib fully awake and he can get himself to sleep, no problemo. But boy does he hate going to sleep at night no matter how tired he is (and we always try to start bedtime before he gets overtired.) I just remind myself that he’s becoming so much more aware of his environment and knows that he won’t get to see us again until morning. It’s a work in progress and we’ve made some strides this week, so I hope that it continues to improve. Truthfully, though, it’s been one of the hardest things we’ve faced so far. This month we stopped using a swaddle (he started breaking out of it and waking himself up) and now he sleeps in Baby Merlin’s Magic Sleepsuit for naps and at night. It’s the most absurd thing on the planet—he looks like the Michelin man—but it’s a great transition and it’s so stinkin’ cute. Next, we’ll move on to a sleep sack with his arms out. This is the first month where I truly feel like Miles is on some kind of a schedule. We never pushed any kind of schedule on him and I’m so happy for that. Lately, Miles wakes up between 6:30 and 7am most mornings (Robert and I love going into his room together when he first wakes up!) and then takes his first nap within one to two hours after waking. Once he wakes up from that nap, we put him down every two hours for a total of about three naps per day plus a late afternoon cat nap during a walk in the stroller. The boy is powerless to any kind of motion! I’ve tried keeping him awake, but he can’t help catching a few Z’s on the go. Can I admit something totally ridiculous? In the past, I’ve mentioned how much I love wearing Miles and how much he loves it, too. But this month, I only wore him a handful of times. And that makes me so sad! Lately, he’s been completely content being left alone in his crib, on the floor, or in his rock n’ play whenever I need to have my hands free. I’m grateful that he’s such a happy little guy and can entertain himself, but I wish he needed me a little more. (Sob.) I’m sure, like everything else, this is just a phase. But I really miss wearing him all the time. I feel like month four has been a really big shift for me as a working mom. It’s so hard. I’ve felt a lot of pressure (all coming from within, of course) to have everything figured out by now in terms of caring for Miles, our home, our family, and my work. The reality is that I always feel like something is falling through the cracks. I’ve been back to work for more than a month now. July was actually my busiest month of work ever. I wrote 41 articles. I’m starting, slowly, to do more food prep on the weekends and cook more meals for us, but it’s not where I’d like it to be quite yet. I’m still learning how to manage my time during the day, but I end up working most nights after Miles goes to sleep. It’s okay for now, but not ideal in the long run because it eats into the little time that Robert and I get to spend together each day and means that some days I don’t get any time to relax. All of this is to say that I want to have everything figured out and I feel like I should by now, but I don’t. I’m still learning how to allocate my time and be present and effective in everything that I do, but I have a very long way to go. Month five is going to be pretty epic for our little family. I have a huge and exciting new work opportunity and we’re preparing for our move to New York on August 18. I can’t believe that we’re leaving our friends and our life here in Chicago. It feels surreal and, at times, kind of sad. But we’re so hopeful about what our life will be like in New York. In my moments of worry, I just think about how much Robert and I love Miles and the fact that soon he’ll be surrounded by even more people who love him so much. Then, I have no doubt in my mind that we’re doing the very best thing for all of us. *Regarding feeding, earlier this month I posted on Facebook that our pediatrician gave us the green light to start solids at four months old. However, once I did more research, we decided that we’re going to try baby-led weaning (in which baby feeds himself solids—no purees). 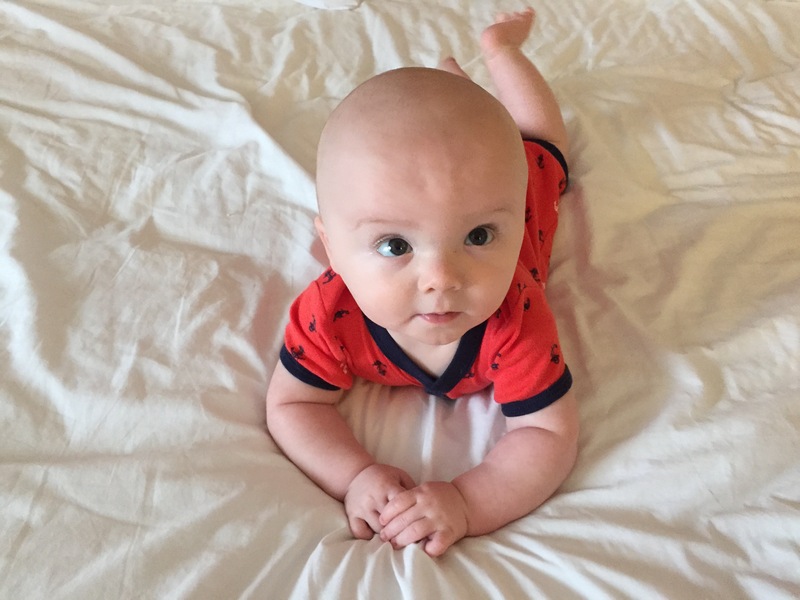 For a variety of reasons it’s best to wait to do BLW until he’s at least six months old and showing all of the signs that he’s ready including being able to sit up unassisted. I’d be lying if I said I wasn’t counting down the days–I’m so excited for that experience to begin and plan to share it with you! This entry was posted in Miles Atlas, Pregnancy & Baby on July 31, 2015 by Paige Greenfield. Girl, The reason you don’t have it ‘all figured out’ is because everything is changing! Just as soon as you figure it out it something will change. Just like you noted, week to week his world is growing. I will say that around 6 months I felt like we could get into a groove for a month at a time. At 1 year 2 months at a time. And at 2 years I will say that we kind of figure things 6 months at a time. Please know that NONE I repeat NONE of us moms have it all figured out. We all struggle to balance our big picture and daily goals.